Brown ground beef in Dutch oven over medium-high heat until thoroughly cooked, stirring frequently. Drain. Reduce heat to medium. Add carrots, onion, celery, garlic and salt; mix well. Cook 5 to 8 minutes or until vegetables are crisp-tender, stirring occasionally. Add all remaining ingredients except macaroni; mix well. Bring to a boil. Reduce heat to medium-low; simmer 15 minutes to blend flavors. Add uncooked macaroni; cook 8 to 10 minutes or until macaroni is of desired doneness, stirring occasionally. Cannellini beans are large white Italian kidney beans. They have a softer texture and milder flavor than dark red kidney beans. Popular in Tuscany, cannellini beans are used in warm salads and vegetable soups. 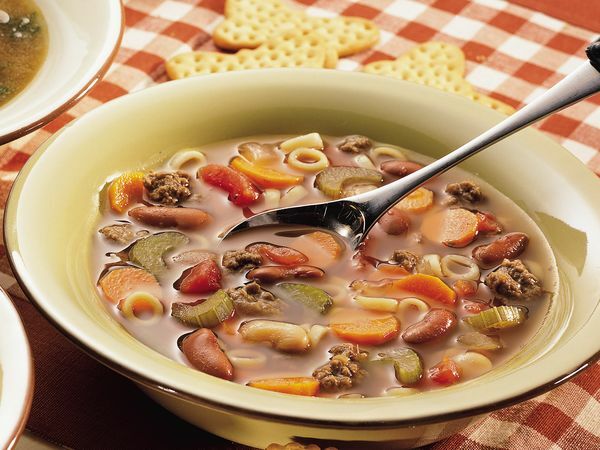 In this soup, Great Northern beans can be used in place of the cannellini beans. This hearty soup is a meal in itself. Complete the menu with soft breadsticks and lemon sorbet.